True to what Jesus prophetically said at Matthew 24:4-5, more misleadings issue forth out of a mighty imposter, the religious system called by men, Christianity, which is really teaching and directing (misdirecting) persons to oppose Christ’s teachings while at the same time duping them into believing that they are following Christ’s teachings. This imposter has – and still is – directing the masses to engage in a practice and ritual Jesus did not teach or practice. The practice is prayer; that is, the manner it which it is to be done. This opposition to listen to Christ is the spirit of antichrist. This spirit issues out of the mouth of the religious system created by men and called by them, Christianity. The nations of the entire world – under the self-imposed religious authorities – have defined for themselves what prayer is, and who it is to be directed to, and how it is to be accomplished. The nations have somehow convinced themselves that the manner in which prayer is to be conducted is what God has established. However, when one looks at how the masses are using and conducting prayer, it is plain to see that it is a gross deviation from what Christ taught about it. This article will present evidence from Jesus’ own words and practice concerning prayer to show that the world today – at large – does what it always does: It’s own thing and not really listening to it’s Creator just as Jesus said it would and warned of his followers not being folded into the thinking and practices of this world. Today, we see this same doing our own thing for the purpose of patting ourselves on the back, human hero worship and making a name for ourselves as a species. God has really been placed on the backburner or not there at all. Note: I personally believe that the people on the plain in the Land of Shinar built a high tower as a flood survival mechanism. They were fully aware of the devastation of the Noahian flood (which was not global as the earth was not populated yet. It was the world of Noah’s day who would have been localized in a relatively small area). Should there be another deluge, the people could climb on top of them to get to higher ground. I believe that more towers were built and would have been built had God not confused their language. Sorry for this digression. Are all of these things something God or God through His Christ taught us or are they inventions of men? Prayer is simply a provision instituted by God so that His creation – mankind – can communicate with Him, one who is invisible to them. Each of us persons can easily communicate with each other because we can literally see and hear each other. It does NOT take an act of faith for human-to-human communication because of the literally seeing and hearing of each other. We have CONFIDENCE of the fact that the human we are communicating with is there because we literally see and hear them. Prayer to God is a part of our worship to Him. When persons pray out in the open visibly and publically or even in a group, they show a lack of faith and their worship of God is NOT with spirit and truth. It is simply not true worship, but false worship; it is man-made and man-made directed worship of God. It makes no sense to pray to and worship in VISIBLE ways the God who is INVISIBLE. Why pagan worshippers do that! Their worship and prayers to their gods are by visible means because they can see the handiwork of the gods they created. This should not be the case of our worship and communication with The One True God who is invisible. Yet sadly, the religious system called by men, Christianity, has taken the world down the path of the pagan and has taught worship and prayer to the One True and Invisible God in the way of the pagan god worshipers: As one who is visible. Communication involves a Sender, a Channel, and a Receiver. Communication is two-way. In the case of followers of Christ, the only link or channel between God and men is Christ himself. The roles of the sender and receiver are interchangeable. When we pray to The Most High God we take on the role as the sender and God the hearer or receiver of our prayers. When God answers our prayers we become receivers and God the sender. Today, prayer has become ritualized. What do I mean by this? When many people pray, they assume some outwardly or public (to be seen and heard by others) special position or posture that I mentioned above: Kneeling, bowing of the head, closing the eyes, folding the hands, saying Amen and/or In the name of Jesus. Yet, do we see such examples practiced by Christ or his disciples? Jesus showed here that our prayers were to be private (invisible to others). When Jesus was speaking here, he was speaking to the individual, not to the group. There is no way an entire group can pray and their prayers be considered private and invisible. One has to imagine that Jesus is talking to them as an individual. It would be improper to pray to the Father in heaven within a group setting because it would be a group prayer and not a private and individual prayer. Plus, the left-hand would know what the right-hand is doing. (Matthew 6:3). The manner in which we pray should be such that the left-hand would not know what the right-hand is doing. In other words, if we as an individual make a request from God in prayer on the behalf of others in need, for example, we do not want to advertise it in front of a group! Yet, if a group of believers come together and pray together for others in need, then each one within that group is advertising to each other and all present. There is nothing private about it. And, when one prays in this manner, they are seeking attention upon themselves. It is a person in a public restaurant bowing his/her head and closing their eyes and praying before eating a meal. That’s advertising! 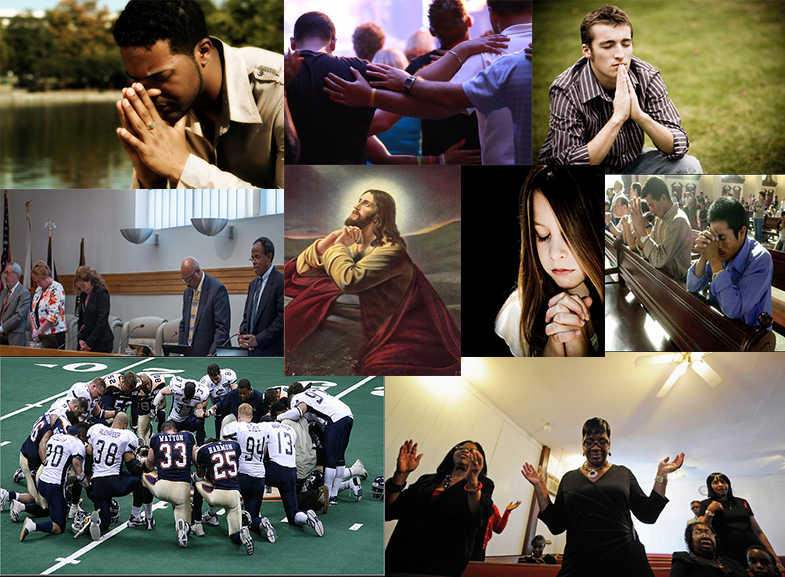 These persons want others to see them praying … I suppose to let others know that they are somehow godly or Christians. According to Jesus, they are hypocrites. Do not be like the hypocrites, for they love to pray standing in the synagogues and on the street corners to be seen by others. Let’s suppose ourselves lending someone in need $100. Do we lend the money to the person in front other others or do we do it in private, invisible to others? Further, do we after making the loan, advertise our so-called good deed to others? Sadly, many do because they want others to praise them look at them as being good and godly persons; to be seen by men. That praise from men is all of the reward they will get. Yet, this is wrong to advertise what we do in coming to the assistance of another in need. God knows what we have done, if it was done in secret and he will reward us in secret. His reward might not be material things, but something much more valuable and which cannot be taken away: Wisdom, understanding, and knowledge. There is no need to tell others what we did to help another in need. It is the same with prayer, we want to engage in it as an individual. The only persons present are YOU, Christ (The Way and Channel), and God. The only person visible of the three is YOU. Your prayers MUST be done in private (invisibly) and not before other humans. Sadly, many claiming to follow Christ create loop-holes and false reasonings so as not to listen to what Jesus said in Matthew 6:5-6 and they continue with public prayers and group prayers. Yet, when we look at Christ’s examples of prayer to the Father in heaven, we do not find any examples of him praying with anyone. Yes, there are examples in the Bible that make it appear that Jesus is praying with others but after closer examination, it is not prayer that he is involved in. Sit here while I go over there and pray. Jesus withdrew away from his disciples to pray – not with them – but to pray to his Father in heaven in private. This is in keeping with what he taught at Matthew 6:5-6. And he took bread, gave thanks and broke it, and gave it to them, saying, “This is my body given for you; do this in remembrance of me. In the same way, after the supper he took the cup, saying, “This cup is the new covenant in my blood, which is poured out for you. Jesus took the bread. In other words, someone present handed him the bread and he thanked that person. And, then he proceeded to speak to THEM telling THEM what the bread and the cup symbolized. There is no praying here. People have been indoctrinated to think that when the expression “Giving Thanks” is used, it means prayer. Such things come from men, not from God and Christ. Also, when Jesus withdrew away from his disciples to pray, do we read of him kneeling down, bowing his head or folding his hands? No! So where does all of this stuff come from? It comes from the inventions of men and their religious systems who are falsely teaching people a ritual that Jesus did not teach. When we pray to our Father in heaven, it must be done privately and as an individual. Yes, two or more persons may pray to the Father over the same matter, but each one must do so as individuals. God accesses your individual heart condition and sincerity when you pray to Him. I am certain that when persons engage in group prayer, there will be individuals within that group who will not feel the same as the others praying in that group. They may say Amen with their lips, but in their hearts, they are saying something entirely different. When a group says Amen, then all in the group is agreeing. Yet, in reality, all might not be in agreement and God does not access the “heart of a group” but the heart of the individual. That is why each one of us must pray to the Father privately as individuals so that he can reward us as individuals. But the things that come out of a person’s mouth come from the heart, and these defile them. For out of the heart come evil thoughts—murder, adultery, sexual immorality, theft, false testimony, slander. These are what defile a person; but eating with unwashed hands does not defile them. So audible prayers in front of others carry no weight. They are not prayers anyway. It is what we say to God in our hearts in private is what counts. I am not saying that one cannot verbally speak to God in prayer from the heart, but it must be done individually and in private. I can be sitting in a public place such as a restaurant, for example, about to eat a meal and I can withdraw to a private place mentally and pray to the Father without any outwardly posturing that would indicate to others present that I was praying. The left does not know what the right hand is doing. And back this left-hand, right-hand thing. Each one of us has a right and left hand. They are members of our body. Followers of Christ make up a body. They are fellow members of the body. Each member within that body may have different abilities and gifts that God gave them. The point I am making here is that when Jesus said, “Do not let your left-hand know what the right-hand is doing” this was in relation to prayer and that we do not even let FELLOW MEMBERS of that body in Christ know what we are praying about. This shows that group prayer and praying publically is improper and not something Jesus taught or practiced. The deeply indoctrinated will resist and oppose at all cost what is written here. They want to do what they want to do and engage in a practice passed down to them by tradition. Yet, it is not a tradition and ritual passed down by Christ. Many might say, “What is the big deal?” It is a very big deal when it involves the truth of what Christ taught and practiced. If persons take attitudes such as that, then there is no limit to what one would teach as truth and it is not. And, that is exactly what is occurring on a very large-scale today. Christ is not being listened to, a religious organization is. It pleases God when we obey Him in His command to listen to His Son, (Luke 9:35) It pleases our Master Christ Jesus when we listen to him and follow his lead and no one else’s. So, if we are told by any human or human agency that such things are accepted teachings and practices of Christ and there is no evidence that Christ taught such things, then one would be wise to reject the human and human agency producing and pushing such teachings and cling tightly – very tightly – to what Christ taught. And, if someone insists that a teaching or practice is from Christ, put it to the test we are directed to at 1 John 4:1. The idea of pre-testing is simply a way of getting persons not to question anything but to accept everything told to them without examination or investigation. I know as a former Jehovah’s Witness to question or put to the test any teaching issuing out of the Watch Tower Bible and Tract Society will get you in trouble; disfellowshiped (kicked out) of the organization. This is all the more reason to worship the invisible God and Creator through His Son (who is also invisible) and cling tightly to the person of Christ and not to the bodies of religious organizations. They are NOT the same. The person Christ is alive and able to teach us. He always teaches the truth. It makes no absolute sense to attach oneself to ANY religious organization and allow them to teach THEIR respective BRAND of Christ. There are over 41000 contending brands out there and they ALL say they are teaching the truth. That is not possible as there is only one Truth and one Teaching and it can only come from the PERSON of Christ, not THROUGH religious organizations. When YOU pray, YOU must not be as the hypocrites; because they like to pray standing in the synagogues and on the corners of the broad ways to be visible to men. What is a synagogue? It is a place where people are congregated under a common belief. Yet, Jesus used the expression standing in the synagogues to show that even fellow believers are not supposed to engage in group prayer because it is NOT PRIVATE but PUBLIC even though it is within a church setting. Yet, Jesus is not being listened to in this regard because the religious system called by men, Christianity, has indoctrinated all NOT to listen to him but to the listen to THEM. Well, at least the image of the person below portrayed as Jesus shows Jesus being alone in prayer and not in a group. Most people inherently resist change especially if it goes against things they were taught as true or factual. I know and I understand. Yet, if they truly examine what they are doing and believing and honestly ask themselves, “Am I really listening to Christ and obeying him, or am I listening to the particular religious organization that I belong to? Do the teachings of my religious organization truly line up with what Jesus taught? I am I afraid to find out because of what I might discover or out of fear of being kicked out? Do I defend my church at all cost uncaring that it might not be teaching Christ? Do I truly champion Christ’s teachings and his word is final, not what any religious organization says? Do I assume that my church or religious organization teaches what Christ taught? Who has more influence over me: My religious organization or Christ himself? These questions must be given honest examination. Most persons will rationalize it away and not given them careful thought because they feel that their religious organization is being picked on and they will defend it. They assume that their particular religious organization is teaching the truth so no examination of it will take place. Then there are those who know deep down inside (like an itch you cannot scratch) know that something is wrong. But they take a morally sitting posture and do nothing and allow themselves to be fed teachings that do not come from Christ. They just go along with things. I can tell you, that the powerful men behind these religious organizations claiming to be of God and Christ are the ones driving this monstrosity called by men, Christianity. They have been responsible for the taking into captivity billions of persons into their religious organizatiosn so as to control them, tell them what to believe, and more importantly direct them away of the truth of Christs teachings in preference of their own – while at the same time massaging the consciences of their captives (members) teaching them that they are on the right path and serving God and Christ. There is a living person that calls each and every individual who would hear his call to them to become his disciples. He has not directed anyone to build up structures and slap fancy names on them and told people to go into THEM. His call is to come to HIM directly as his disciples. The Son of God cannot be seen. His is like his Father in heaven invisible. (Col 1:15). The Son of God is not a flesh and blood entity and should not be visualized as a White man with long hair in a white robe. Such images are false and dangerous. That both the Father and Son are invisible and unseen by the human eye, it requires FAITH on our parts to worship God and serve our Master Christ. It does not take faith to look at a painting or a drawing of a portrayal of God and Christ because those things can be seen. Yet, the religious system called by men, Chistianity, place these false images in their literature, in art and in film so that an impression of Christ is that of a White man with long hair in a white robe. We are to pray to the Father – who is unseen or invisible – and He sees what we (the individual) has done in secret (prayer). Our prayers are for God to see and hear NOT for others to see and hear. If we pray openly in public or in a group setting, then our prayers are not done in secret, others see and/or hear what we are praying about. We are not to advertise and seek reward (praise) from others when we pray. But that is exactly the result of public and group prayer. Prayer is to be done in secret – alone – between the individual and his/her God and no one else. Sadly, the entire religious system called by men, Christianity – has mislead all of those within her to believe and practice something Jesus said is hypocritical. Yet, very few claiming to follow Christ listen to him in this regard. I encourage all who seek to be free from the clutches of this great enslaver and deceiver of men to pray intensely to the Most High God for His wisdom, knowledge and understanding in this matter (and others). One must be free to worship God and serve our Lord Christ in freedom from the demands and requirements of religious organization and on the terms that God has laid out for us and as taught by His Son. The system of religion called by men does want you to be free. They desire enslavement of persons within itself so as to control you and tell you what is proper and acceptable as if those things are from God, but are not. Yet, it has not taught and followed the example of prayer Christ taught and practiced. Neither has it taught the truth. Yes, it has taught truthful things, but it is not the same as teaching the truth. I cannot because the truth is not within her, it is only in the person known as Christ. Next Article Why The Watchtower Will Fail?